Cortlandt resident Daniel Del Monte opened a contracting business in 2006. The business began as a provider of handyman services and later did such larger jobs as kitchens, bathrooms and basements, as well as window and door installations. “We really found a niche with the kitchens and the bathrooms,” he said. 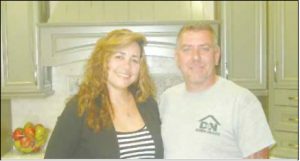 “That urged us to move on and open up a showroom and focus on the kitchens and baths.” About two-and-one-half years ago, Dan and his wife, Nancy, opened D & N Kitchens and Baths in Montrose. The D & N refers to the couple’s first initials. “We live in the Town of Cortlandt, so it just made sense to stay with in the town,” Nancy Del Monte said. “We offer everything you would possibly need to do your kitchen or your bathroom,” Daniel Del Monte said. Among the items sold at the store are windows, doors, tile, plumbing fixtures, cabinets, and flooring, he said. “We install everything,” he said. “So you don’t have to worry about hiring a plumber. You don’t have to worry about hiring an electrician. You come in, you buy everything here and I take care of everything.” The store’s customers mainly come from throughout Westchester County. D & N Kitchens and Baths is located at 2101 Albany Post Rd. in Montrose. For more information, call 914-603-3077 Ext. 102, visit DandNKitchensandBaths.com or send an e-mail to dandnkitchensandbaths@gmail. com.